A Solid Etalon Filter (SEF) is used to select a periodically spaced frequency grid from a broad spectral range. The key specifications of these filters are Free Spectral Range (FSR), and Finesse. 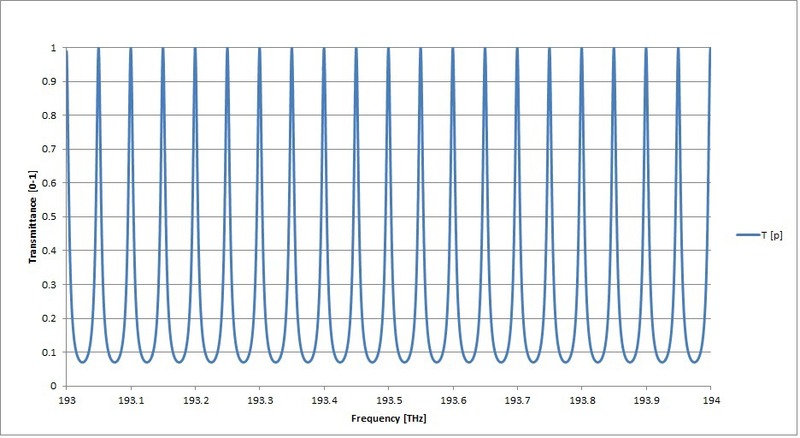 The FSR of a SEF is equal to the spacing between the transmittance peak frequencies. The finesse is said to describe the sharpness of the transmittance peaks and is equal to the FSR divided by the full width at half maximum (FWHM) of the transmittance peak frequencies. The SEF is a version of a simple etalon, Mirror|Spacer|Mirror, in which thin film dielectrics are used as the mirrors and a solid glass substrate is used as the spacer. Iridian’s SEFs are made up of two plane parallel reflecting surfaces, side A & B, separated by a quartz substrate with thickness “d”. The SEF is specified/quantified primarily by two parameters: Free Spectral Range (FSR) & Finesse. where -3 dB BW is the bandwidth at –3.0 dB (or the full width at half maximum) of the peak frequencies.